If you've been wondering if you can use the Cricut pens when you're using Cricut Craft Room, the answer is yes. The E2 is the easiest to use for this exercise as it doesn't automatically unload the mat when it has finished cutting. This allows you to remove the pen and replace it with the blade. The Expression on the other hand (and most likely the Cricut Personal and the Cricut Create) do unload the mat after it has finished cutting when using CCR. This means that it's difficult to reload the mat in exactly the same position the second time, which can result in your cutting line not exactly lining up with the drawn line. But it can be done. You need to take care when you load the mat. Load it snugly to the right hand side for both the drawing and the cutting and you should get your two layers to line up. I haven't been able to use the Cricut Pens on the Imagine while using CCR. For some reason it just unloads the mat instead of drawing the design. The Cricut Pens do work with the Imagine however if you're not using CCR. Go figure! I don't have a Cricut Mini so have no idea whether it works with the pens but I suspect it would. Here's the instructions for using the pens using the E2. I'm using the Window image from the Christmas (Solutions) cartridge. Place your image on the mat and poisition it to where you want it. Remove the blade housing from the E2 and replace it with your pen. Make sure your E2 is connected to your computer and powered on. 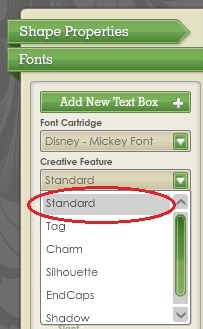 If your cartridge isn't linked to your Cricut.com account you will be prompted to insert the cartridge if you don't already have it in the machine. You can change the blade depth and speed here. The recommended settings for the pens are a speed of 3 and a pressure of 2 however you should experiment with what works best for you. Press the Cut button to send the project to the Cricut. Load your mat into the E2 using the Load mat button on the E2's Home screen. Press the Continue button on the CCR screen. You'll see this box and the project will shortly start to "cut" with the Cricut pen. When the E2 has finished drawing your image it should stop and not return to its home position. CCR will return to the mat screen. Very carefully (making sure you don't move the blade carriage) remove the pen from the housing and replace it with your blade. The blade housing will return to the top right of the mat then proceed to cut the design on top of the drawn layer. And here it is removed from the mat. Have you ever clicked the Cut or Go button and seen this error when you go to select your device? The error says "The project was created using an incompatible template and cannot be cut/printed on this machine". The most likely reason for this error is that you are trying to cut/print to a Cricut that has a different size mat than the one you created your design on. In the above case I created my design on the 6" x 12" mat for the Cricut Personal and tried to cut it on the E2. There's two ways to fix this error. 2. Leave the Default Machine setting the way it is and connect the Cricut Personal. 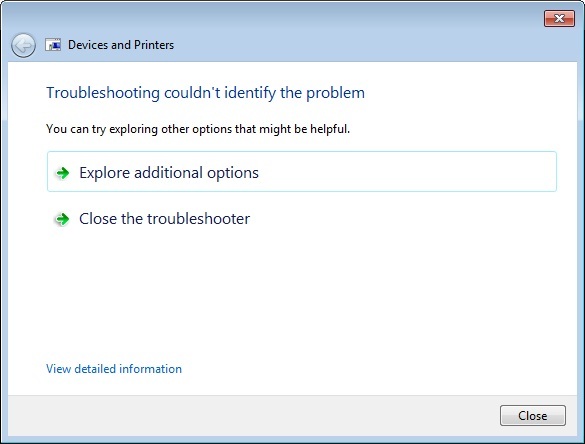 In both cases when you go to Cut/Print your machine will now be available to select and you won't see the error. Unfortunately it looks like the latest CCR update removed the link to those promotional carts. I'm hopeful that the update that gives us the ability to link all our Gypsy carts to CCR will fix that problem. When you purchased your Gypsy it will have come pre-loaded with 2 carts - Gypsy Font and Gypsy Wanderings. Last year there was a promotion where if you registered your Gypsy by a certain date (I think it was around October 2010) you received five free downloadable cartridges. They were Blackletter, Christmas, Indie Art, Printing Press and Tags, Bags, Boxes and More. PC had a further promotion where you could receive another downloadable cart - Smiley Cards. So which ones can you cut with CCR? Currently CCR won't allow you to cut with Gypsy Font or Gypsy Wanderings. We'll have to wait for an update by PC for those carts to be linked to our Cricut.com account before we can cut with them with CCR. Any digital carts you purchase from Cricut.com will show up as linked in CCR automatically. They will also show up on your Gypsy as a linked cart once you connect your Gypsy to Cricut Sync and update the cartridge content. 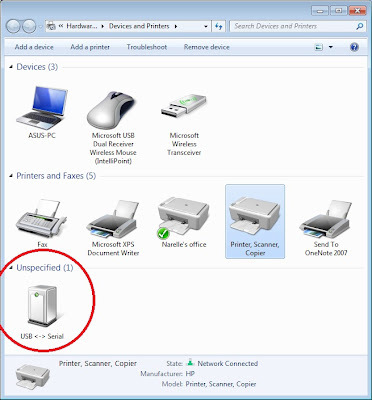 If the drivers for your Cricut haven't been installed correctly CCR won't recognise that you have your Cricut attached. Here's how to go about checking if the correct drivers are installed. If you are using Windows XP please refer to post number 14 on this thread by Mallory from PC in the CCR forum at the cricut message board. 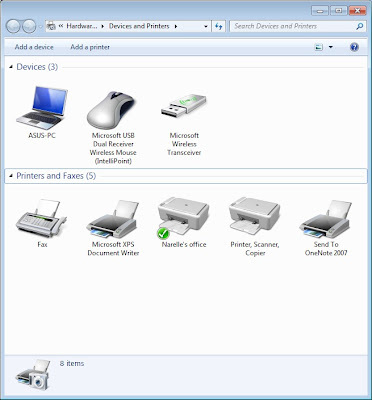 Vista users - the procedures should be the same as for Windows XP. These are the instructions for Windows 7. 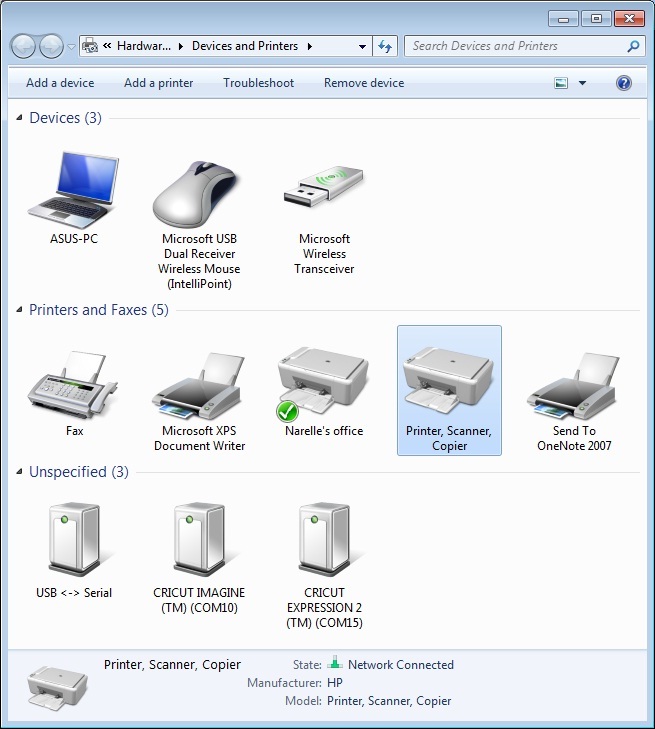 The next box will show you all the devices you have attached to your computer. At this stage there is no Cricut showing. You should see a new device appear under the heading of Unspecified. 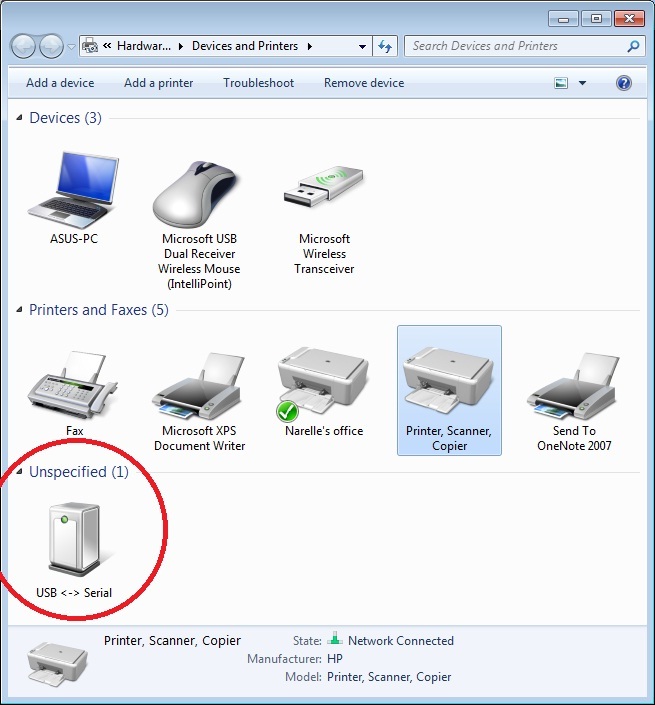 If you are connecting a Cricut Personal, Create or Expression the device will always show up as USB < - > Serial. If you are connecting a Cricut Imagine, E2 or Cricut Mini they should have their correct name. Here's what the Device list looks like with three Cricuts attached. Notice the Imagine and E2 are correctly labelled. 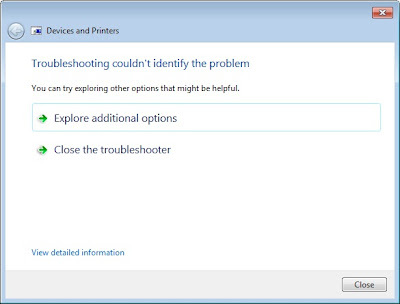 The troubleshooter will open and start gathering information about your device. If it finds any problems follow the instructions. This will most like entail installing the Cricut drivers. When the Troubleshooter has finished try cutting with your Cricut again. My Cricut didn't have any errors so this is the box that appears. Previous builds of CCR required the Cricut Personal to have a firmware version of 1.40. CCR would prompt you to update your firmware but the update process kept failing. This then rendered the Personal unusable until the firmware was re-done using Design Studio. This put the firmware back to version 1.34. On 8th October 2011 a CCR update was released that allowed any Personal Cricut to use the older firmware version 1.34 to cut. Once you have download and installed DS select the Help menu, then Update Cricut Firmware. (Make sure your Cricut is turned off before you start the update). Follow the instructions carefully making sure you select the Cricut Personal as the machine to be updated. You may need to do two passes of the firmware update. If you're prompted to do a second pass make sure you turn your Cricut off again before you start the second pass. When the firmware update is complete exit out of Design Studio, switch your Cricut off and unplug it from your computer. 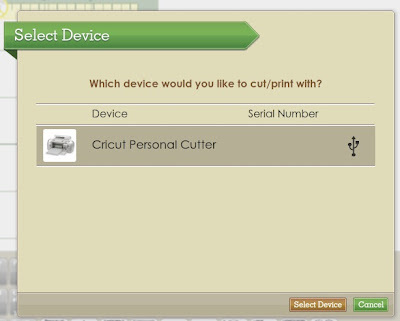 At the Select Device screen click on the Cricut Personal then press the brown Select Device button. The Cricut should then proceed to cut. If the green circle in the middle of the cutting screen turns endlessly, press the brown Stop button. This will take you back to the previous screen where you can press Cut again. (This happened to me. The second time I pressed Cut it started cutting on my Cricut straight away). 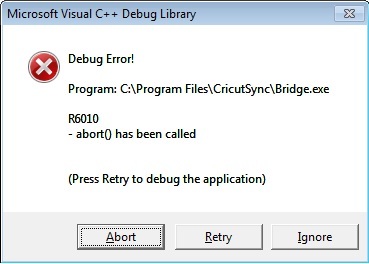 I tried opening CCR a few times but kept getting the error. I uninstalled CCR, re-downloaded it and installed it again. I thought maybe it had something to do with Adobe Air, but just before I was about to uninstall that I noticed that my Gypsy was plugged into my laptop. Picked it up and noticed that it was powered on. I disconnected the Gypsy from my laptop and tried to open CCR again. This time it opened with no problems. I tested it a few more times to be sure and each time I opened CCR with the Gypsy attached and powered on I got the Debug error. If the Gypsy was attached but switched off I didn't get the error. So it appears that both CCR and the Gypsy can't use CCRBridge.exe at the same time. I can't remember whether the Gypsy has always used CCRBridge.exe or whether it previously used a different Bridge to access the computer, but it obviously uses it now. So, lesson learned. You can have the Gypsy attached to your computer when you use CCR, you just can't have it switched on. There is a similar error that pops up if you open Cricut Sync when you have CCR open. This time it's Bridge.exe that is the problem. So if you're trying to update your Cricut using Cricut Sync make sure you don't have CCR running. Just in case you're looking for them, the following carts are currently missing from CCR. You can stop looking now!!! In case you've been vacationing on a desert island recently and haven't heard the news, Cricut Craft Room is now open! Alternatively, when you open CCR you will be prompted to download the latest build. If you don't want to update just click the Ignore button. Don't forget there are two versions of CCR. The Desktop version allows you to design, save and cut your files. The Web version allows you to design and save your files. You need to be online to use both versions so don't let the name "Desktop version" fool you! It's probably a good idea to uninstall your current version of CCR before you download and install the new one. When you open CCR you may be prompted to download/update Adobe Air. CCR needs Adobe Air to work so go ahead and update that. If you haven't tried out CCR yet........ well...... get cracking!! If you're nervous about downloading it to your computer then give the Web version a try. So, what else do you need to do to use CCR? Well, that depends on which Cricut you're using. For the Imagine and the E2 you will need to download Cricut Sync if you don't have it and update your Cricut to the latest programming. 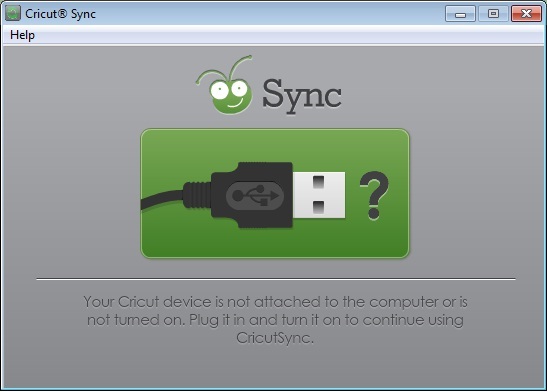 Once you have installed CricutSync connect your Imagine or E2 to your computer, open Cricut sync by clicking on the Cricut Sync icon on your desktop and follow the instructions. For more info on updating your machine follow the instructions at the CricutSync page. Just click on the relevant machine from the left of the page for instructions for your Cricut. Once you have updated your E2 or Imagine, open up CCR. (You'll need the Desktop version for this bit). Make sure your Cricut is still connected and powered on. 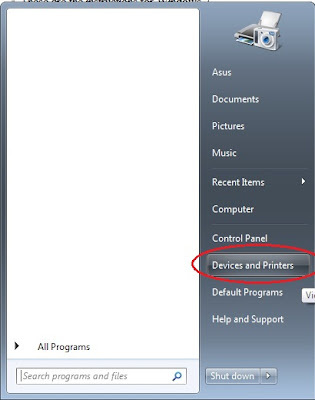 Once you've logged in and CCR is open at the main screen select the Help menu, then Install Drivers. Select your machine from the list. The drivers on your machine should be updated. For the original Expression and Cake machines make sure your firmware is up to date. The easiest way to do that is to use Cricut Design Studio. If you don't have DS you can download the trial version from http://www.cricut.com/cds/Update.aspx. Once you have that installed select the Help Menu, then Update Cricut Firmware. Follow the instructions carefully, making sure you select the Expression as the model you are updating. If you are prompted to do two passes of the the firmware update, make sure you power the Cricut off before you start the second pass. If by chance your Expression doesn't work once you have installed the drivers through CCR, go back to DS and update the firmware again and your Cricut will be working again. For the Cricut Personal, the Cricut Create and the Cricut Cake mini, it appears all you need to do is make sure their firmware is up to date. Follow the instructions above for the Expression, making sure you select your model of Cricut. 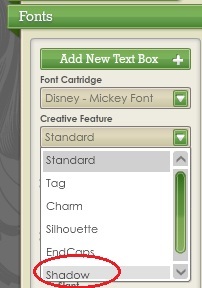 If you are updating the Cricut Cake mini, make sure you select the Create as the machine. There are two ways to type text using CCR. You can drag each letter from the keypad to the mat, or the better way is to use a Text Box. And that's what I'll be showing you today. We'll be creating a welded title and a matching welded shadow. I have opened CCR and created two mat layers. To do that you'll need to have Mat Layers enabled. 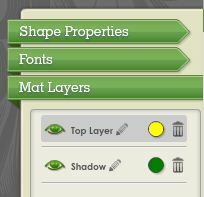 Click on the the Options menu then the CraftRoom tab and make sure Mat Layers Enabled is ticked. 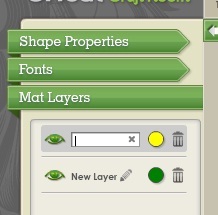 This will add a new menu called Mat Layers. I also have Fill Mode Enabled selected to make the two layers easier to see. Fill Mode makes each layer of your project a different colour. Note - this is just a preview colour - it won't print. I'm using the Cricut Expression 2 so I've selected that as my Default Machine. Because we won't be needing the keypad we can close the Drawer giving us a full view of the mat. Click "Add New Layer" from the bottom of that menu. You'll now have two layers in your design. The active layer will be highlighted in grey. To make it easier to know which layer you're working on you can rename them. 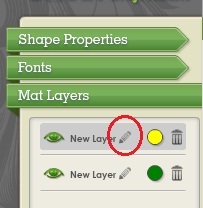 Click on the pencil icon beside New Layer. Type in a new name and press Enter. Repeat for the second layer. To change the Fill colour of the layers click on the coloured circle next to the pencil. Select a new colour then press the Apply button. Repeat for the other layer. Now we'll create our top layer. From the Mat Layers menu click on the Top Layer to make that mat active. 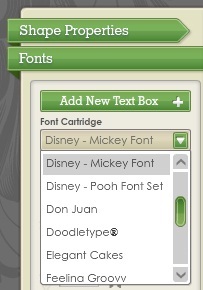 Select the size of your font by clicking on the green arrows or typing the new size in the box. (You can change the font size later if necessary). I selected a Font Size of 2. As you type the word it will appear on your mat. You can move the position of the word on your mat by clicking on the grey section of the text box and dragging it to its new position. You can do this before, during or after you have typed your word. Press the Done button to close the text box. 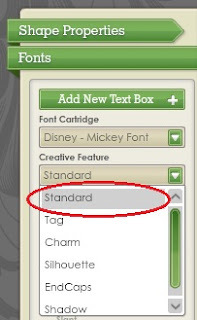 If you need to make changes to your text make sure the word is selected and press the Edit Text button. Next we need to move the letters so they overlap. Make sure your word is still selected then press the green Letter Spacing down arrow. (Make sure you have Character Space selected - not Block. Welding occurs as soon as your letters overlap. Next we need to create the welded shadow. Click in the Text Field box and type your word again. As you're on the Shadow layer it should show up in a different colour. Click the Done button or click on a blank area of the mat. Now you're ready to weld the shadows letters together. However, in this case if you change the Letter Spacing setting, for some reason the top layer and shadow layer won't match up. Go ahead and try and you'll notice that the shadow doesn't quite fit the top layer. In this case the difference isn't huge, but with some fonts it's quite noticeable. You'll see how the shadow of the I and the G don't match up well and need to drop down slightly. We need to create the welded shadow in a different way. While the shadow is selected (check Mat Layers to ensure you're on the correct layer) click the Ungroup button on the Toolbar. Now each of the shadow letters is an individual object and can be moved anywhere. Click anywhere on the mat to deselect the word. Click on the orange P and using the horizontal move handle move the letter to the left until it fits neatly under the yellow P. If necessary use the vertical move handle to move it down. You'll notice that the Weld/Don't Weld box has appeared. That's because the S & the P are now individual objects. As soon as they overlap the Weld box will appear. You don't need to change this option so just leave it as it is. Next click somewhere on the orange R and move it over to the left using the horizontal move handle. Repeat for the remaining letters. When you get to the I and the G you'll probably find that you'll need to drop them down slightly to get the to align correctly. Now that you have the shadows letters all aligned you can go back and group them. Click on the yellow layer and move the word down to sit somewhere below the orange layer. Make sure you still have the Shadow layer selected. Drag a selection box around the orange layers so they're all selected. Click the Group icon from the Toolbar. Your shadow word is now one object again and you can click anywhere on it to move it around the mat. If your orange word turns yellow after you group it, it means that you had the Top Layer selected instead of the Shadow Layer. Which isn't a problem if you want both titles on one layer ready for laying your paper and cutting. If you want to keep the titles on their own layer you can cut and paste the shadow back to its own layer. You aren't limited to whole numbers in the Letter Spacing box. You can type any number (eg. 5.3) to get your spacing just right. It's not necessary to use Fill Mode. I think it just makes it easier to see your outlines. It's also not necessary to use two layers (mats). You can leave Fill Mode off and create both your layers on one mat. Have fun creating your welded shadowed titles!